Earlier this year we saw the awesome oversized N64 pillow made by Donna Marie Evans. Donna was bombarded by requests for the pillow, but last month a customer asked her to make a controller pillow from an earlier Nintendo console. 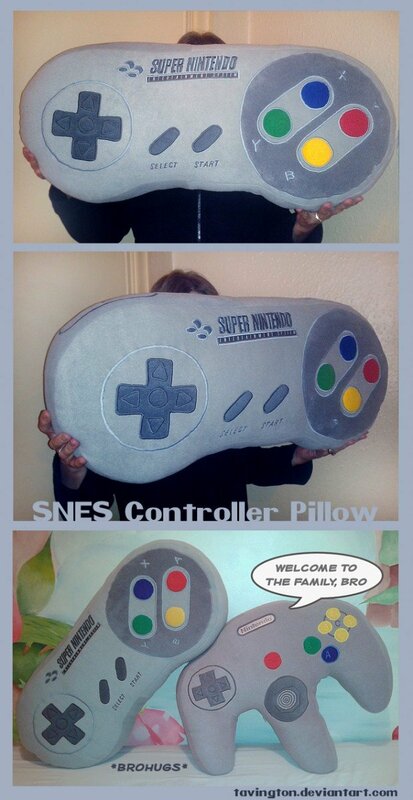 The result is this very huggable SNES controller pillow. Donna said that this pillow was harder to make than the N64 one, partly because of the Super Nintendo phrase. She had to embroider it by hand because she doesn’t have a cutting edge embroidery machine. Contact her on deviantART if you want your own SNES pillow.